Also known as skin prick or scratch testing, allergy skin testing is the preferred and most accurate method for diagnosing environmental and food allergies. Our practice offers skin testing for our patients who may be suffering from an unknown environmental or food allergy for which standard treatments are not adequate. The purpose of testing is two-fold: once an allergen is identified, it can be avoided or eliminated (this is especially true for food allergens). If avoiding the allergen is next to impossible (i.e. 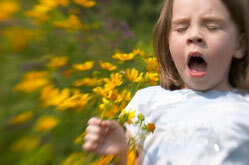 seasonal allergies to tree or grass pollens) and common allergy medications do not relieve symptoms, immunotherapy can be implemented to decrease the body's response to the allergen over time. If you are interested in allergy testing for your child, please ask one of our providers or call our office for more information.